"This simple recipe is a combination of banana cheesecake and banana cream pie all rolled into one dessert! It uses an Oreo®-cookie crust instead of the traditional graham cracker crust, adding a bit of a chocolate accent. Plus, it uses fat-free cream cheese, but proves to taste rich and creamy for a banana-y treat! Garnish with whipped cream and sliced bananas, if desired." Mix cookie crumbs and butter together in a bowl. Press mixture into the bottom of a 9-inch springform pan. Mix cream cheese and sugar together in a bowl using an electric mixer until smooth and well blended. Add eggs 1 at a time, mixing after each addition. Stir in mashed banana and vanilla extract. Pour mixture into crust in the springform pan. Bake in the preheated oven until center is almost set, 50 to 60 minutes. Cool completely, at least 1 hour, before removing from pan. Whisk milk and pudding mix together in a bowl until thoroughly combined. Fold in whipped topping. Arrange sliced bananas on top of cooled cheesecake. Spread pudding mixture on top. Chill at least 3 hours before serving. Easy to make and tastes amazing, brings back the days of Nanar Pudding. Soooooooo good!!!!! I just created an account here BECAUSE of this recipe and put it in my favorites! Absolutely delicious! Layers of rich flavors that will have you savoring it! New “secret” recipe to bring to get togethers!! Fantastic! 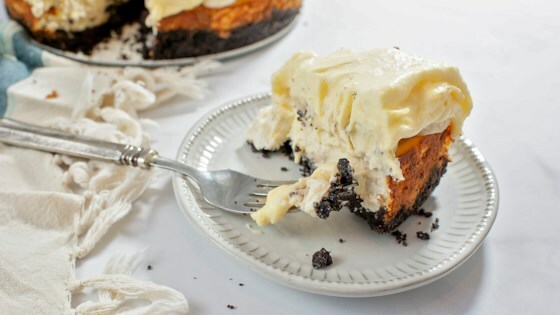 I made it with a graham cracker crust instead of the Oreo cookie crust and it was amazing! It is delicious. I think I'll add some mashed banana in the cream next time.